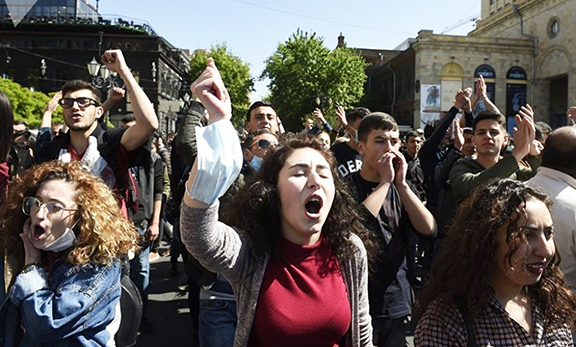 HOPA, Turkey – A Hamshen Armenian husband and wife have been arrested by Turkish authorities within two days of each other for being Armenian. As a result of the arrest, their eight-year-old son Arev, who witnessed his parents being hauled away, is now alone. According to Turkish media, Cemil Aksu was arrested Wednesday while Nurcan Vayic was arrested two days prior during when Turkish police raided their house in the middle of the night. Vayic has already been convicted and sentenced to three months imprisonment for her anti-government writings online while the husband has not been charged yet. Aksu and Vayic were both bloggers who actively criticize the Turkish government. Vayic has extensively written about the growing fascism in Turkish government, which has recently called for persecution of the people of Hamshen. Her friends are convinced that her arrest was a direct result of an organized plot against her. Aksu was the Hopa District Chair of the Peoples’ Democratic Party and was one of the editors of “Gor” magazine. His wife was the former chair of the Hopa Socialist Party of the Oppressed (ESP). The couple also owned a cafe in Hopa named Babil, where they displayed and sold leftist literature. Aksu was released following his deposition. The town of Hopa, in the Hamshen region of Turkey is 11 miles from the Georgian border near Javakhk. The west and the world powers keep tolerating Erdogan the intolerable thus becoming partners with the crime.